You like solving puzzles and devising strategies. Your behaviour is focussed around making the most efficient decisions. Your major brain region is the orbito-frontal cortex, an area just behind and above the eyes involved in making decisions, and the nucleus accumbens (or “pleasure centre”) which is closely linked to it. Your chemical messenger is dopamine, which is chemically similar to cocaine, and is involved in habit formation. If you were an animal, it would be an octopus. Favourite games of Masterminds surveyed so far include Animal Crossing, Chess, Chrono Trigger, Fallout, Half-Life, and Zelda . Your BrainHex class is related to Achievement-Mechanics motivation (Yee), the Manager (DGD1), Strategic play (Temperament theory) and Ludus (Roger Caillois), and is partly related to Hard Fun (4 Fun Keys), and the Explorer (Bartle Type). 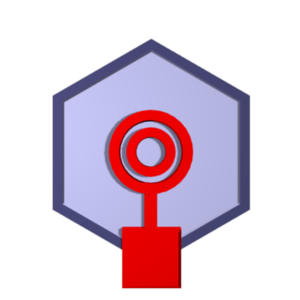 Your BrainHex Icon depicts the orbito-frontal cortex ("decision centre") as a square, connected to the nucleus accumbens ("pleasure centre"), representing that strategic thinking and puzzle-solving brings you pleasure. Your pleasure centre has double lines to indicate that it is highly stimulated by your play style. I liked this quiz. I think that the category that I got fits me perfectly, I love puzzle games and I always strive to do everything in the game that I possibly can before going on to another game. I hope you guys follow up with other quizes. Interesting result. I would have pegged myself as a seeker rather than mastermind, but the two scores were close with 19 and 17. I can see how it fits as I'm a problem solver, and definitely octopus fits me better than cat! In games, particularly MMO's, I always think of myself as the explorer type. As with all of these kinds of attempts to classify, I can see a bit of myself in each category, which is reflected in the test scores. I found this ti be a fun and very interesting test/quiz. It did failry accurately decribe how I am. that was a really interesting quiz!!! Considering I am a chess geek... this sounds about right =P. "Similar to cocaine?" Durrrrr. Cocaine is a selective dopamine reuptake inhibitor, not "similar to" dopamine. Apparently I'm a Mastermind-Achiever. Does this mean I have to work out how to retake this quiz to ensure I can hit all of the classes/sub-classes? While I don't really like obvious puzzles in games, I really do enjoy finding the most efficient way to do things. Even better is finding a completely new way that is better! Evolution of play is the most important thing to me, which I think is why puzzles like Rubiks Cube do not engage. And once I play Chess against someone who is 'trained' to use game formulas, I lose interest too. An open systemic game such as Civilization is much more interesting to me over the long run. mlkjhgfds: some ad hoc solutions for breaking ties have been applied. These don't affect the data gathered for our statistical analysis, and most respondents aren't affected. Arrkhal: reuptake inhibitors are chemically similar to the proteins they affect, otherwise they would not be able to affect the same binding sites. I noticed during the quiz that there were relatively few questions that adressed "tactics" as distinct from "puzzles". Puzzles need to be solved, tactical challenges need to be solved, but also involve an element of group activity or perseverance. Though I'm good at it, I HATE being asked to solve an ordinary puzzle in a game (move squares around, etc.). I LOVE being asked to solve a tactical challenge (i.e. the fight IS a puzzle). (I love Disgaea and tabletop wargames, for example). I scored high on "conqueror" and "socializer" and only a notch lower on "mastermind"--but I feel like there's some other category in between--like "general". I don't kow whether this is really relevant to your research, but I definitely felt like that type--and the games that that type likes to play--falls between the cracks of the questions the quiz asks. Z: it's important to remember that what we're doing here is surveying people and gathering data - the seven classes are simply boxes that the results are sorted into to give the respondents some immediate feedback about how they tested, based upon likely neuro-biological underpinnings to that person's play. In the analysis of the results, the individual classes will be a very minor part of the statistical number crunching. I think there is a distinction between a static puzzle and a dynamic puzzle (between problem solving and tactical play) that you allude to here, but I don't have a way of drawing this distinction down to the biological level at this time. this is rather close to me as far as the catagories go. only thing is i'd preffer to be a bird, just to know what flying's like. Hmm. I generally dislike turn-based strategy games, RTS games, management games (sims), and tactical shooters. I dislike chess, as well, even though I'm not utterly awful at it. Furthermore, I also prefer fast-paced games to slow-paced games, with the exception of brain-teasers and the occasional RPG, which I'd rather think through at my own pace. I really wonder how heavily the third page was weighted; I can think of particular instances in which I really enjoyed each of these experiences. As it happens, I felt obliged to move the "unity with other players" option down a bit, but I absolutely love coordinating on a fast-paced strategy with a medium group of players; it's just that I rarely get the chance to play with skilled folks for long enough for me to get an affinity with them. One additional aspect of online gaming that I do not like is the common tendency of games to impose strict roles on team players. Implement the tools and let me find my own job to do, thank you kindly. I enjoyed playing a Bard on old Everquest precisely because I could fill a broad range of support roles; I was never the meat-and-potatoes of the group, but I was the condiment tray that offered complements for any dish. To get a bit more specific, I detest rock-paper-scissors overlays in games; I have no interest in losing to Alice and beating Bob just because I picked Ro to their Sham and Bo back at spawning or creation time. To be fair, Mastermind is probably a somewhat fair assessment for me in spite of all this. In online play, when I win against a challenging opponent, it is often because I move through the terrain efficiently and quickly, or because I am able to get a grasp on the strategy that's necessary to win the match, whether it means running away and being a recurrent nuisance or bum-rushing an entrenched foe before the overall situation can tip beyond recovery. One other thing on that note; I'm surprised at how low my "survivor" score was, given that I spend a lot of time being a tactical survivor in games. I do often start off aggressively, but that means adopting measures to stop turnarounds later in the match, and in honesty, I like the desperate feeling of knowing that I'm near the top of everyone's kill-list in-game; it keeps me sharp and diverts more entertainment my way. If that's not at the core of being a "survivor," I don't know what is, unless it's just flinching when a zombie pops out of the wall. In which case...yeah, I'm less likely to flinch than to just shoot the stupid thing in the head. Oh, and oddly enough, I do like octopi, whether in an aquarium, in fantasy, or on my dinner plate. Coincidence, I'm sure. What is Chrono Trigger doing there? And why there aren't any strategia games like Age of Empires, Hearts of Irons and so on? chris said "reuptake inhibitors are chemically similar to the proteins they affect, otherwise they would not be able to affect the same binding sites." OK, so I should be able to swap in a competitive ACh inhibitor no probs, hey? Strange... I am an avid strategy game fan who loves pretty much every game that falls under the "mastermind" category (bar half life 2), yet apparently I am a "conqueror". Alf: your high listing of the unity response did skew your results - sorry about that! Fortunately, when we study the data we analyse all of your results individually so it won't affect the results of the study. Tsukaji: the favourite games listed are compiled from the lists of games that people who typed to each class chose themselves - I don't know why Chrono-Trigger is popular among Masterminds, but it is. Rev Wrink: no test is perfect... it's likely you're a Mastermind who *really* likes to win, and this has put you into Conqueror. I didn't put it down as one of my three games, but I came out as a Mastermind, and I love Chrono Trigger. Maybe our types are drawn to it because of certain time-centric sidequests, or the combo system, or the smart, breezy pacing, or (most likely) the multiple choices available throughout the game. Not really a Mastermind. But I would give me the sub-category of Mastermind, would prefer Survivor though. The test has shown me to be clearly Mastermind, but then I got to read "Your chemical messenger is dopamine, which is chemically similar to cocaine, and is involved in habit formation." Does this imply easily getting addicted to drugs? Experience from the past has rather shown the opposite, I've smoked for about a year but had no problems at all giving it up. Some mastermind: No, Masterminds are not more likely to be addicted to drugs, in fact, on the whole they are probably less likely. Dopamine is an important part of the habit formation mechanism (from which all our behaviours occur) and it is involved in addiction, but in the case of Mastermind the dopamine is being triggered by decisions made in the orbito-frontal cortex (which is closely tied to the part of the brain that generates dopamine).